Mondrian in Action Book ~ Business Intelligence y Big Data: ¡Aprende Gratis sobre Analytics! Great!! 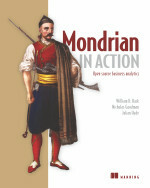 Reading first chapters of 'Mondrian in Action', bought in http://www.manning.com/back/ for mondrian, olap and pentaho passionate. Thanks William D. Back, Nicholas Goodman, and Julian Hyde!! Las 20 mejores Herramientas de Visualización?